Water temperatures in Gran Canaria vary between 18ºC and 23ºC, depending on the current season as well as ocean depth. Thanks to these ideal temperatures, activities such as swimming, diving and all sorts of watersports are possible to enjoy all year round. Water temperatures in Gran Canaria fluctuate only by a few degrees during the year; the coolest are found off the coast of Gran Canaria, near the Atlantic from February to April. As for the warmest, you’ll be surprised to find they’re not in July or August, but rather September and October. During these months, the sun shines bright and strong on the Playa del Ingles in Maspalomas and all beaches on the isle. Combined with calm, summer seas and crystal clear horizons, these months make for great beach days. 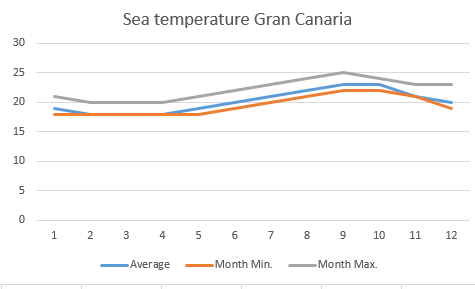 See the following table and diagram of water temperatures in Gran Canaria (note that some local differences apply). The flatter the seafloor, the warmer the temperature. A protective reef surrounding the beach, such as with Las Canteras beach in Las Palmas, can also be beneficial to swimmers due to its ability to help keep waters warm as well as weaken the force of incoming waves, providing excellent conditions for certain watersports. See also: Weather Gran Canaria. Playa del Ingles and Meloneras offer the most pleasant water temperatures across-the-board due to their favorable location on the island, one which allows for a temperate climate almost all year round (warmer surroundings mean warmer waters). The sea notably begins to cool again in November but despite this, swimming remains enjoyable in December, potentially even all the way up to March, though temperatures during these months often dip to 18ºC. If you’re looking for a little extra warmth during chillier months, Amadores Beach, for example, has a sheltered bay; the extra protection may provide slightly warmer waters. In the same vein, a few spots in the south of Gran Canaria including Playa del Ingles, Maspalomas, along with Puerto Rico and Puerto de Mogan, are protected from trade winds. Another option to consider are sea swimming pool’s – two of which can be found in Castillo del Romeral. These are large, somewhat closed off bodies of seawater with little movement, easily warmed by the sun. 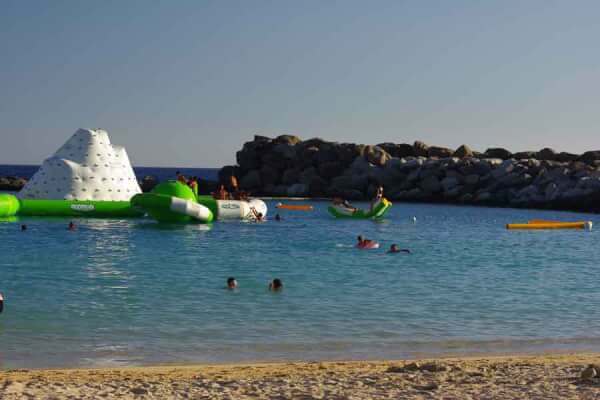 Diving and Watersports such as surfing, parasailing and banana boating are viable in Gran Canaria all year round! Thanks to consistently warm water temperatures, Gran Canaria is a wonderful destination for various watersports even in the Winter. Of course, there are still days where weather conditions are less than favorable for the beach, however these usually don’t last long and provide an opportunity to explore the other awesome activities Gran Canaria has to offer on land, sun or rain 🙂 For more information regarding diving, refer to our article Diving Gran Canaria. The reason for Gran Canaria’s superb climate is not only year-round, spring-like weather and temperature, but also the Gulf Stream, specifically a tributary of this sprawling ocean system – the Canary Current. Both water and air temperature would be warmer without the cooler sea water coming in from the Gulf Stream, in fact, without the Gulf Stream and trade winds, the Canary Islands would have a climate similar to North Africa. The Gulf Stream allows for an overall milder climate than the Islands geographical location would imply. Considering all these factors, it’s no wonder The Canary Islands are such a popular travel destination, especially among ocean lovers. The Gulf Stream itself is a large, warm and fast flowing Atlantic ocean current consisting of the Portugal Current, Canary Current, North Equatorial Current, Antilles Current and Florida Current. It is also part of the thermohaline circulation, a global maritime flow system. Towards Europe, the Gulf Stream splits – one part becomes the North Atlantic Drift, a stream that influences the climate in Northern Europe. Sea Temperature Gran Canaria written by Bella D.